You know, I think I'm losing my appreciation for ice cream bars, I just seem to be on a string of disappointment. The Crunch bar, the Butterfinger bar... Don't get me wrong, these Edy ones aren't bad, it's just that I keep expecting to be impressed and it just doesn't happen. Actually, I was impressed with my first bite, but then it went a bit downhill from there. Ok, let me start from the beginning. 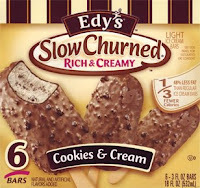 I was debating the treat of the week when I saw Edy's take on the light ice cream bar. They look good enough on the cover, so in the shopping cart they went. I unwrapped one tonight and started getting my hopes up. They look even tastier in person. I took the first bite and was very pleased. That bite was mostly made up of the tasty chocolate coating. Mmmmm, couldn't wait to take a second bite. The only problem was, there wasn't as much coating in that second bite. I continued onward. The light ice cream itself isn't bad at all. While the chocolate coating itself is good, the cookie bits in the coating seem to suffer than bland fate that I keep running into. Overall I was basically satisfied, but that first bite did set the bar just a bit too high. I'd say that I like it a bit more than the Breyer's ones, but we are kind comparing apples (Cookies & Cream) and oranges (Vanilla & Almond) here. I know what to expect now, so I'll try to eat the next one a bit slower and we'll see what happens. On Second Scoop: Ok, I just had another one and I was a little too harsh the other day. You have to go slow when you eat these so that your taste buds have time to recognize the tasty chocolate shell in every bite. The texture of the underlying ice cream is also nice. (It's funny because it has a brownish color to it actually, almost looks like chocolate cookies and cream).